What’s better than one island in paradise? Two, of course. Connected by a 550-yard wooden bridge, Conrad Maldives looks like an image from a postcard. Seemingly remote, the hotel is, in fact, just 30 minutes from the capital, Malé. Visitors arrive at the floating jetty in the middle of the bridge by seaplane, before turning either left, to the smaller Rangali Island, or right, to Rangalifinolhu. The latter houses all of the resort’s beach villas, sheltered by lush jungle and boasting an outdoor shower and thatched bathing pavilion. The stone tubs are ludicrously large, so ask a member of staff to start filling yours up while you’re still at supper. Alternatively, make your way across the terrace, past the private plunge pool and through the foliage in search of the pristine white beach that stretches around the whole island. Even in high season, you might not encounter another soul. Rangali Island’s water villas are more modern in appearance, using fewer traditional materials. Perched on stilts, their standout features include steps directly into the turquoise lagoon below, an ocean view bath and a glass desk set over glass floor panels. Exceptional facilities include a dive centre – guests can pick up complimentary snorkelling kits, including prescription masks – a spa on each island and tennis courts. Guided snorkelling tours, during which I swam alongside feeding turtles and giant manta rays, and excursions onboard the resort’s luxury cruiser, spotting dolphins at sunset, were made even more memorable by the smiling and knowledgeable staff. Rarely have I stayed somewhere where the team were not just polite, but genuinely warm and engaging. There are a staggering 12 bars and restaurants spread across both islands. The underwater Ithaa restaurant, where you can watch colourful fish and juvenile sharks dart past your table, is perennially popular, but my favourites were always the meals served alfresco, with sand between my toes. Ufaa by Jereme Leung celebrates Chinese cuisine and its signature dish is a traditional mixed hot pot, served in a birdcage-like structure and stuffed full of seafood and tender beef. At the Lobster and Champagne beach grill, you can eat at the water’s edge as the sun sets. Going barefoot is encouraged throughout the resort, not just at supper, but it’s wise to keep a pair of sandals to hand – the exposed wooden paths can reach skin-scorching temperatures in the strong sun. A small price to pay for staying in paradise. Some 250 miles off the coast of East Africa, there is still something wild and untouched about the island of Madagascar. The centre is home to the Merina tribe – descendants of 16th-century Indonesian colonisers – and the shallow waters are dotted with the wrecks of Portugese, French and English pirates, attracted to Madagascar’s beguiling shores in the 17th century. This is Arcadia with an edge. Miavana brought a new sense of luxury to the country when it opened earlier this year, but it’s still deliciously remote, perched on its own private island in an archipelago on the northern coastline and best reached by helicopter. Its design is inherently fun and easygoing: the mish-mash of styles ranges from the industrial (the steel-framed beachside villas) to the handmade (colourful woven chairs and bright, ombre curtains). The beach is shallow and safe for swimming, but a continental shelf deeper into the ocean provides the perfect habitat for a dizzying array of marine life and the hotel is famed for its ‘blue safaris’. Back on the mainland, you can enjoy lemur treks and forest walks. 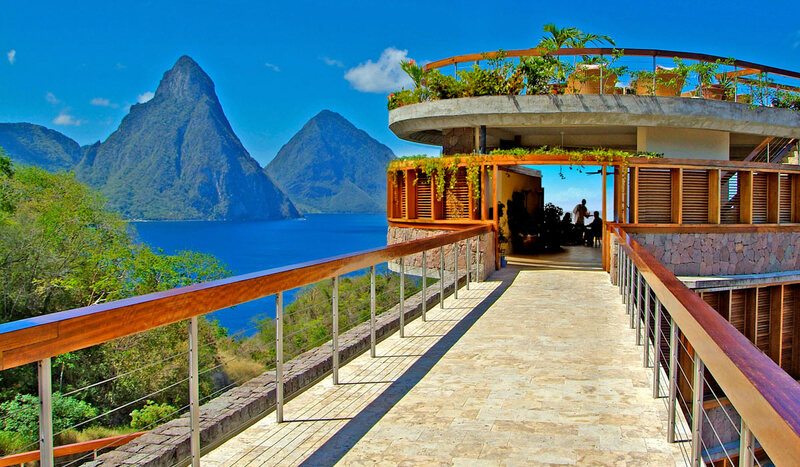 Rooms are known as ‘sanctuaries’ at Jade Mountain. Many are only accessible by private bridge and all are open to the forgiving Caribbean elements, enjoying unbeatable views of the ocean and the majestic Pitons, or volcanic peaks, for which the island is famous. The sanctuaries include major domos – private butlers – to cater to your every need, individual infinity pools, private sunbathing areas and oodles of space for in-room spa treatments, all set to the tranquil soundtrack of Nature. If you do decide to leave your room, make sure that you sample the delectable eggs royale for breakfast, before heading to Jade Mountain’s organic farm to pick your own cocoa beans, which can then be made into a sweet treat by the onsite Chocolate Laboratory. End each day with a nightcap in your room, watching the fireflies dance in the twilight. Unsurprisingly, I’ve never slept better. The Wategos beach towel (below), £75.41, The Beach People (www.